Eight months after the conflict began, the situation in the country is still critical. According to the latest UN OCHA report, 1.1 million people are facing emergency levels of food insecurity and an estimated 3.8 million people will require assistance by the year end. According to UNICEF and the World Food Programme, nearly 1 million children face acute malnutrition. They say that without a swift response 50,000 children could die from malnutrition this year. Archbishop Daniel Deng Bul has written to the Archbishop of Canterbury to seek the continuing support of the Anglican Communion and other partners for Phase II of the Church’s humanitarian response. Archbishop Daniel calls for prayer and support to the Church of South Sudan “at this critical moment when the South Sudan community is threatened with famine”. Guided by the provincial Emergency Crisis Committee, SUDRA (the Church’s humanitarian wing) has worked with colleagues from across the ECSSS to reach 44,000 people, those most in need, with food rations and 5,000 people with medical support. They have focused on isolated communities unreached by other NGOs. 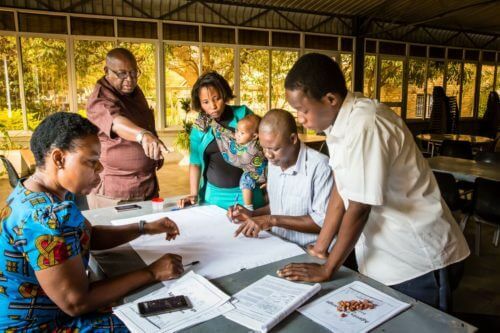 The photo above shows a diocesan team conducting registration and needs assessment. For the wider Anglican Alliance it has been a remarkable response, seeing churches and agencies from across the Anglican Communion standing together in support of ECSSS’ humanitarian initiative, some directly partnering the Church, others through the ACT Alliance. Many agencies have launched appeals in their own countries and have worked with their provinces in advocacy for peace and calls for prayer. In Australia, Anglicans from the South Sudanese diaspora have played a leading role in raising awareness and funds. The Anglican Alliance has provided a platform to coordinate this support so that ECSSS can work to a single reporting framework. Episcopal Relief & Development and Christian Aid have given technical support to SUDRA in developing and delivering their humanitarian response. Seven months after the conflict began and despite peace negotiations, over a million are displaced and in need of assistance. The insecurity meant that many communities were not able to plant their crops in June and the threat of famine looms. According to the UN OCHA report around four million people are in need of support, of whom only half are currently being reached. The Church has suffered too, with members killed and thousands of members, along with their clergy and bishops, displaced by the fighting, while church buildings and other property has been destroyed. ECSSS will shortly begin Phase II of its response, prioritising four areas: continued relief distribution to the northern states in South Sudan, peace building/reconciliation activities at local and national levels, psychosocial support to traumatised children and adults, and vocational training/income generating activities through the Mothers’ Union to help families recover and regain self-reliance. Details of the Phase II appeal are here. There is also an inspiring video generously produced for the Anglican Alliance by Episcopal Relief & Development, with colleagues in ECSSS. 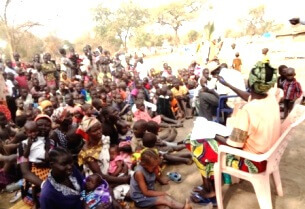 This video can be used in activities by churches and agencies around the Anglican Communion to support prayer and encourage giving so that together we can accompany the Church in South Sudan and help keep the situation in the consciousness of the world.